Toast of Gaslamp GIVEAWAY! - San Diego Dining Dish! It’s time to toast the holidays and reclaim all that is merry and bright – and what better way to welcome Winter than with a group of your friends and family enjoying festive cocktails, notable nibbles and shopping discounts around the beloved Gaslamp Quarter?! 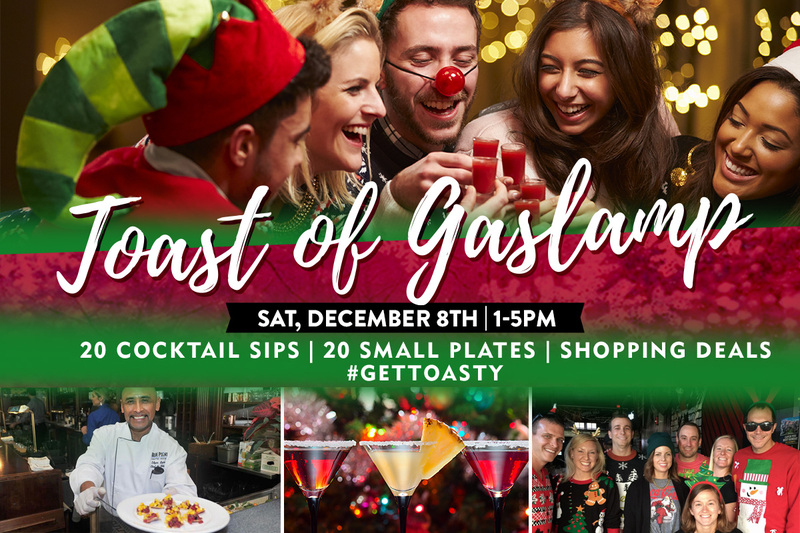 The Toast of Gaslamp is pleased to bring on the season’s greetings with another festive self-guided walking tour onSaturday, December 8th, 2018, from 1pm to 5pm, that will have you tasting, toasting, and shopping with 20 sips, 20 bites and 10 shopping deals! Toast of Gaslamp is the perfect way to spend an afternoon festively feasting through two dozen of Downtown San Diego’s best bars, restaurants and retailers, with each stop sharing their seasonal specialties for you to enjoy along the way. Tickets are only $25 in advance and $30 on the day of the event. Don’t forget to round up your fellow elves, dig up your favorite ugly holiday sweater and flaunt your best pair of reindeer ears for a chance to win the Gaslamp Grand Prize Giveaway! One lucky festive winner will receive a package filled with Gaslamp Quarter goodies including gift cards, prizes from restaurants, shopping and more! All you have to do is don your festive attire to receive a raffle ticket upon check-in to participate, then toast your way through the Gaslamp and head back to check-in at 5pm where the winner will be announced! For more information, to view a list of participating restaurants or to purchase tickets, please visit www.toastofgaslamp.com. This is one of my favorite events of the entire year, and I've done it twice (see my wrap up here). It's just a fun, silly time, and it's so festive to be out in holiday wear sipping cocktails and eating delicious bites. McFarlane Promotions has kindly gifted me two tickets for the event on December 8. To enter, simply comment here with your favorite Christmas movie, and the winners will be drawn on Thursday, December 6. Good luck!